Toronto, ON: There’s no mistake that SUV’s are becoming the norm for most families. Why wouldn’t they? They check off all the requirements: higher seating position, lots of room, technology, and of course, off-road capability. And to ensure that the needs of buyers are met, manufacturers are spending more time, energy and resources than ever before, and it shows. In the premium category, Infiniti has completely redone the QX50 into a vehicle that has now become a top contender. 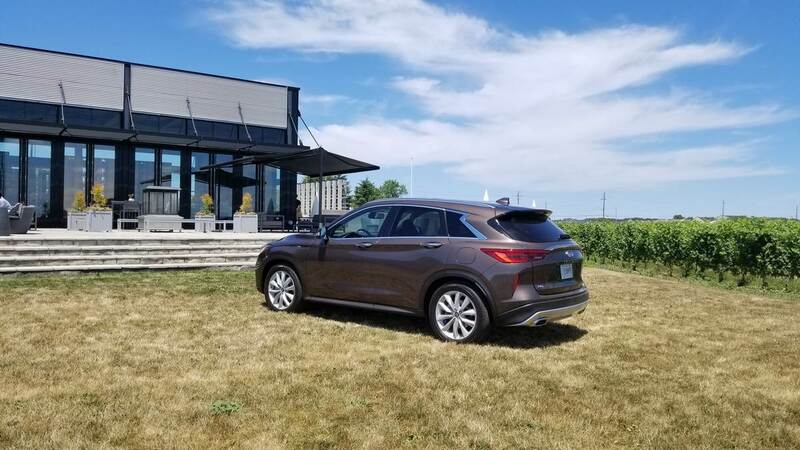 We were invited to Toronto and the beautiful roads of the Niagara region to see, drive, and experience the 2019 QX50. When we think of Infiniti, the first models that come to mind are the EX35, G35/G37, and of course, the FX45. These models, with their distinctive exhaust notes, were hot sellers for many many years. And then, Infiniti went into a slight slump with name and model changes. However, for the past few years, the brand has been on the up and up. And the new QX50 is poised to go head-to-head with rivals in the competitive compact SUV category. 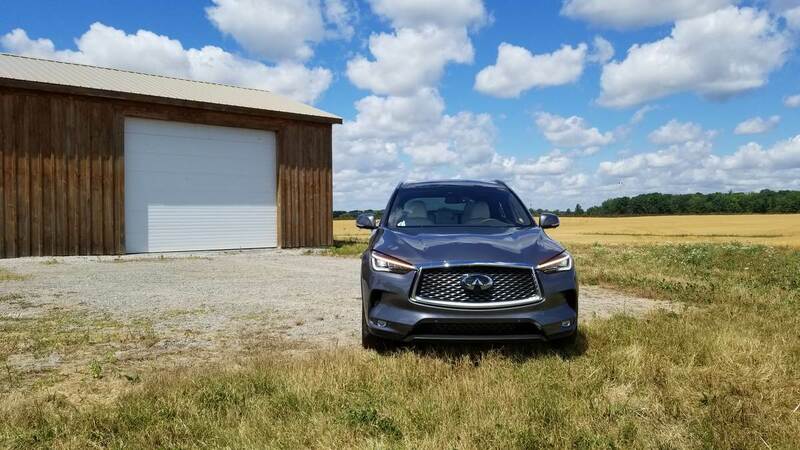 What most people may not know is that Infiniti has been a leader when it comes to industry firsts; there was the rearview monitor, lane departure warning, Around View monitor, blind spot intervention, backup collision intervention, and direct adaptive steering are just a few. The 2019 QX50 is equipped with another world first – the Variable Compression (VC) Turbo engine and let me just say, it’s a beauty. A production version of an Infiniti VC Turbo engine was first unveiled in 2016 at the Paris Auto Show and even back then, competitors were shaking their heads, thinking it was not possible. Move forward to now, and the impossible has become a reality. And according to Infiniti, it’s a game changer. What is variable compression technology in the QX50 engine? Well, in simple terms, it’s the best of both worlds in terms of power and fuel economy. Kind of like if you had an athlete that was both a sprinter and a long-distance runner. 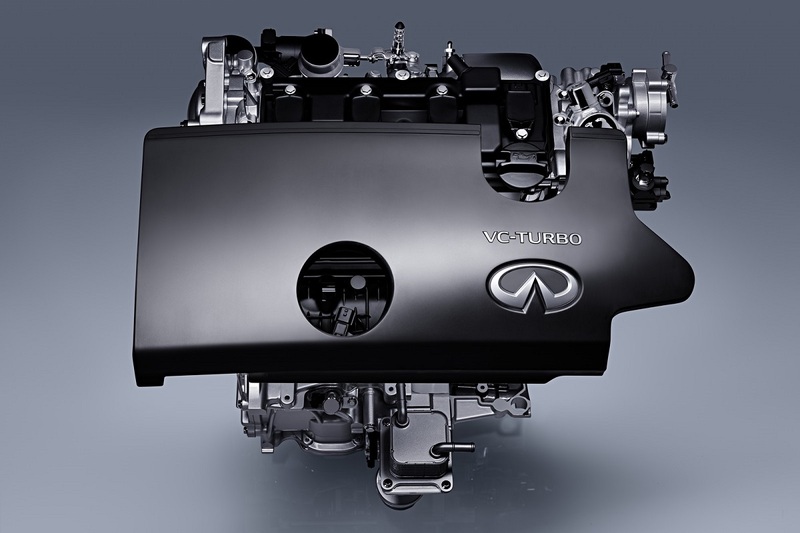 Infiniti engineers designed a diamond-shaped piece for the new engine that varies the compression. This “multi-link” is able to produce a lower compression ratio (8:1) for power and a higher compression ratio (14:1) for fuel economy. Of course, there is other technology that’s involved, some of which include direct and port fuel injection, dual variable valve timing, cylinder head integrated exhaust manifold, wide-range turbo, and multi-link variable compression ratio. Click (here) to see how this system works. So, does it really work? Absolutely! We learned that the 2.0L four-cylinder VC-Turbo engine found in the 2019 QX50 has 25% more fuel efficiency than the outgoing 3.7L V6. That’s huge, considering the rising gas prices all across Canada, especially for us in beautiful British Columbia. So, what’s the downside? Well, if anything, the new engine produces less horsepower than the outgoing V6; but for most, it won’t matter because the new VC-Turbo engine produces more torque (280 lb-ft. vs 267 lb-ft.) and we all know that torque is what gets the car moving. 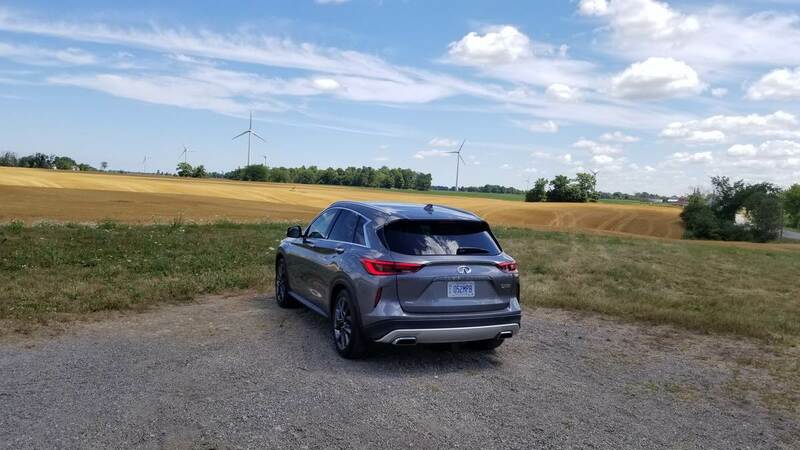 Speaking of moving, we drove the 2019 QX50 from Toronto to the Niagara region, where we were able to get a real-world experience of the vehicle rather than just the numbers. What really impressed me about the vehicle was ride quality and comfort. 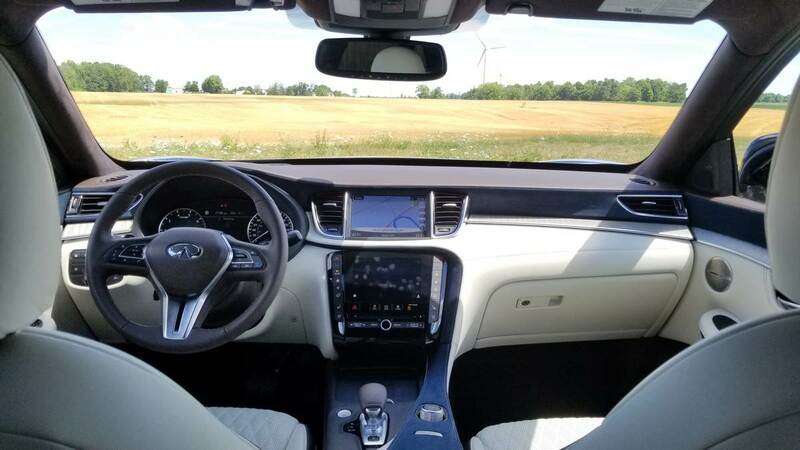 As we’ll talk about later, the interior of the QX50 is very nicely appointed, where occupants appreciate the look, fit, finish, and luxury materials used. 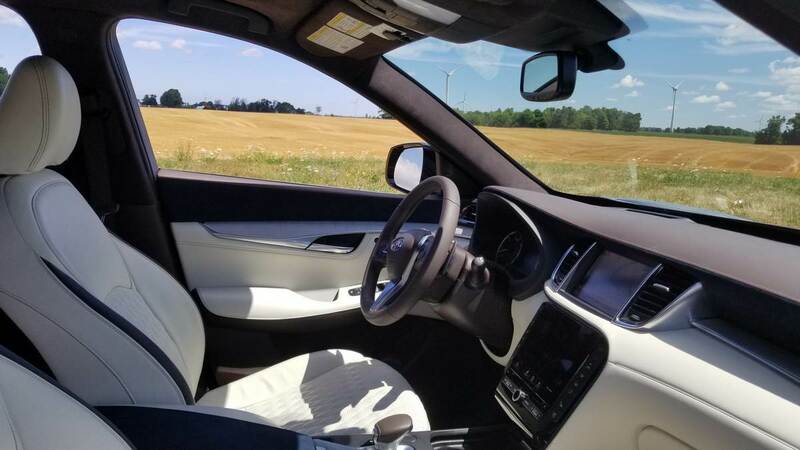 We drove the highest trim levels which also featured special climate controlled, premium grade leather, NASA zero-gravity seats and boy were they comfortable. Combined with a spacious, quiet cabin, this is an SUV you can drive each and every day without ever feeling tired. The QX50 tackled all the roads with utmost confidence, thanks to above average handling. The vehicle feels light and nimble, like the way a daily driver SUV ought to be. The steer-by-wire Direct Adaptive steering is good, although not as responsive and accurate as a Stelvio or F-Pace. But it’s not supposed to be; the QX50 isn’t claiming to be an enthusiast SUV. Although we didn’t need to utilize the Intelligent All-Wheel Drive, we’re confident that the system will perform perfectly in most Canadian climates and regions. Power in the QX50 is creamy smooth. You won’t be snapping any necks during acceleration; in fact, off the line, power delivery is slightly slow. But it builds quickly when the turbocharger kicks in. And the extra torque is definitely noticeable. The 2019 QX50 no longer uses the 7-speed automatic and VC-Turbo engine is mated to, get this, an Xtronic CVT. Before you stop reading and say NAY, let me tell you that it’s not the conventional CVT you’ve experienced before. The Xtronic CVT is quite good and does a good job of keeping the transmission in the optimal powerband, especially when you’ve got the vehicle in Sport Mode. Whether we were on the highway, side roads, or on inclines, the CVT behaved better than expected. There are four driving modes that are standard – Standard, ECO, Sport, and Personal – my suggestion, don’t ever touch the ECO mode. Standard mode is good for every day driving, and probably the default for most owners. I found Sport to be slightly exhilarating and it was my driving mode of choice during this drive event. I alluded to this point before, but it needs to be said again. During the drive, we found the cabin to be ultra quiet, grave-like. The use of active engine mounts, acoustic glass, and better insulation really solidify the QX50 as a luxury vehicle. Even driving at 110 km/h on the highway, my co-pilot and I carried on our conversations without ever raising our voices. During a lunch stop in the Niagara region, I really had the chance to admire the beauty of the vehicle. The previous generation QX50 was not a bad looking vehicle, but it really didn’t raise any eyebrows or instill a feeling of want. The 2019 QX50 changes all that. The new look is much more SUV-ish; handsome, planted, and with styling cues that really make you look. Infiniti believes that based on styling alone, the QX50 will be a hot seller in the Canadian market and we agree. The long, one-piece, clamshell shaped, all-aluminum hood is beautiful, overhanging the front fenders. 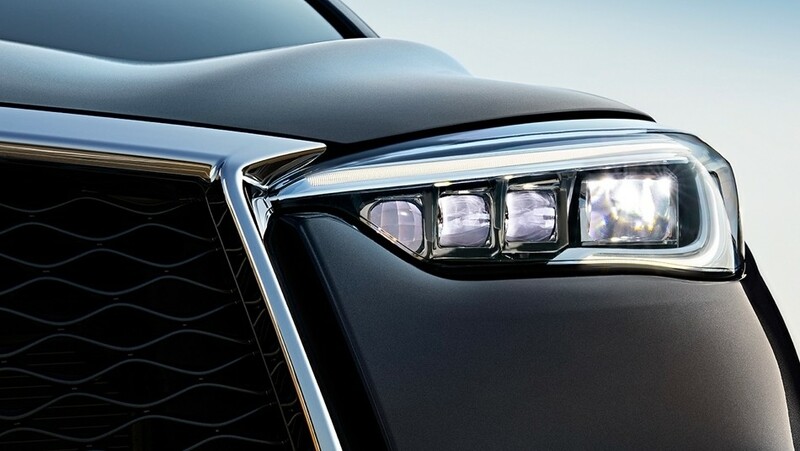 The LED headlamps mimic the human eye, a concept that is carried through many elements of the vehicle. Then there’s the larger signature Infiniti grille, complete with a diamond mesh pattern, that really give the QX50 an imposing presence. The QX50 is now taller and has a more powerful side profile, thanks to the entire cabin having been moved forward. And a beautifully sculpted character line that runs the entire length of the body exemplifies that the designers paid attention to every detail. The beauty of the vehicle really shines in the cabin of the QX50, so much-so that it placed in this year’s Wards 10 Best Interiors. There’s plenty of space and all passengers will enjoy a good amount of leg, shoulder, and head room. I sat in the back seats, which slide and recline, and was surprised on the comfort level. Our top trim was adorned with natural maple open pore wood inserts, really connecting the occupants with natural beauty. Hats off to the designers for choosing great materials for the entire interior of the vehicle. The dashboard layout is not only ergonomic, but attractive. I found all controls to be within reach. What’s more is that Infiniti has kept hard buttons for simple things like climate control, climate seats and basic radio controls. Yes, there are still two screens utilized for the infotainment system, which have been optimized; however, I found the system to be slightly sluggish and not up to par with the rest of the vehicle. News has it that the next generation will have an updated system which should fix these minor blemishes. 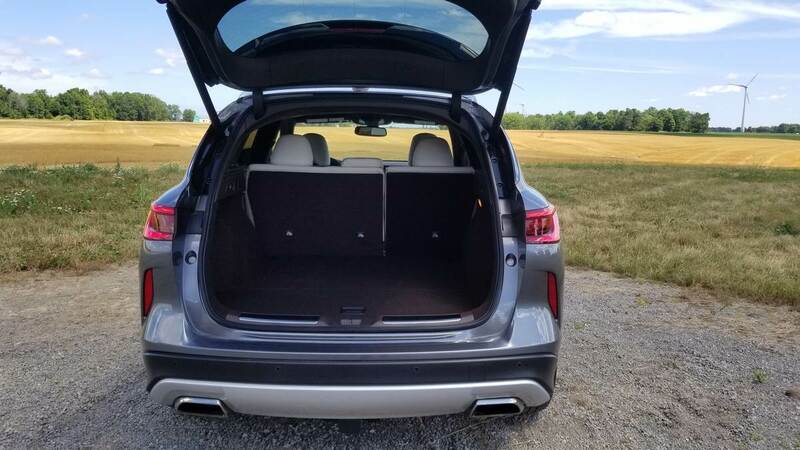 If we thought cargo area was great before, it’s even better now, with 880 liters with the rear seats up and over 1,820 liters with the rears reclined. You can fit a full-size stroller, luggage, and even more in the cargo area with ease. And of course, being a luxury vehicle, everything in the QX50 can be accessed hands-free. Since most buyers of the QX50 will be family oriented, there are a myriad of safety features, both standard and optional. ProPILOT Assist includes Distance Control Assist, forward emergency braking, blind spot warning and intervention, backup collision intervention, predictive forward collision warning and intelligent cruise control. Infiniti does emphasize that ProPILOT Assist should be used for its intended purpose: complement the driver and not be autonomous. 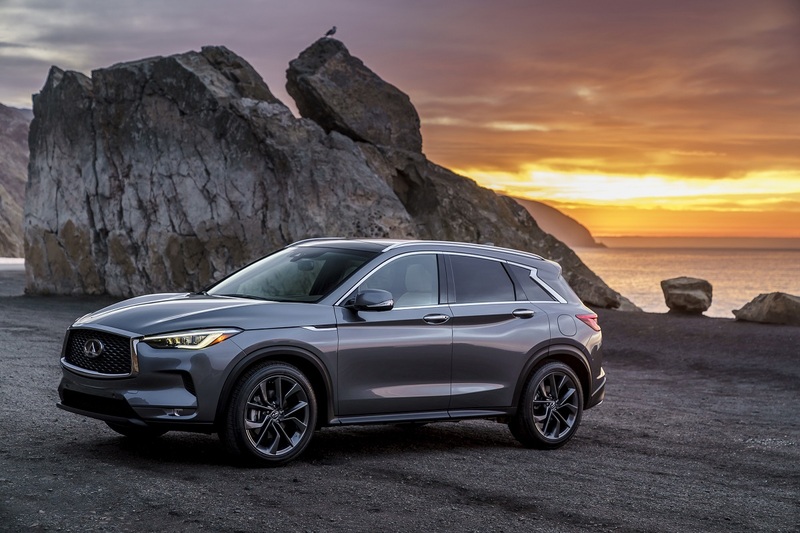 The 2019 QX50 Luxe model starts at an attractive $44, 490, putting it neck and neck with the Japanese imports and slightly less than the German counterparts. The top-of-the-line Autograph trim will run you $57, 990. The compact luxury SUV segment is one of the hottest in the automotive world, with manufacturers putting out some amazing products. In recent, Infiniti has really turned the brand around, revealing some pretty impressive products. 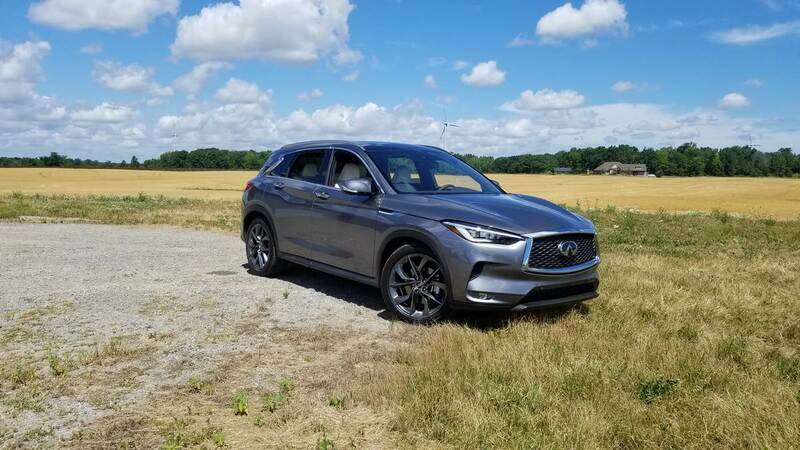 With top-notch design, an award-winning interior and some great technology, the 2019 QX50 has its eyes set on wearing the crown in this segment. Who knows, maybe they’ll even bring back that iconic exhaust note.